You’ve bought yourself your first thumper and one of the last things the old owner mentions to you is not to forget to turn the petrol tap to the “On” position before riding. You get home, hope on, kick her up and off you go ... but after not even a minute the bike comes to a slow, jerky halt. You kick again and again but no response from the engine. Aah, then you remember and check the petrol tap ... “Off” ... eish, it’s flicked on and after a few kicks you let out a sigh of relief as she roars back into life. And so we all came to learn about the ‘petrol tap’ ... or did we? Points 1, 2 and 3 are the different fuel levels you’ll have in your tank at different stages of riding. 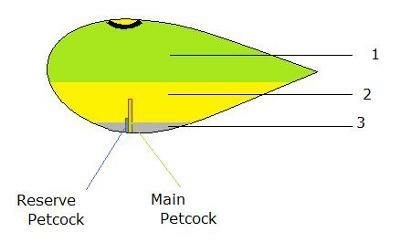 Also illustrated are two nozzles through which the petrol is sucked into the carburator, namely the ‘Main Petcock’ and the ‘Reserve Petcock'. Level 1 would be the level at which your tank would be predominantly full, while you’re enjoying some flat-out riding. Half tank would be illustrated by number 2’s section, whilst Section 3 illustrating the last litre of fuel left in your tank, otherwise known as ‘Reserve’. What happens when your bike comes to a slow halt after a few hours riding in the ‘On’ position? Basically, with your fuel tap on the ‘On’ position the fuel is being sucked through the taller of the two petcocks, thereby sucking clean fuel from the top of the tank. When your bike begins burbling with a jerk now and then, you know your fuel level is somewhere around level 3, or in other words you’re running out of fuel. This is when you turn your petrol tap from the ‘On’ position to the ‘Reserve’ position, thereby changing the flow of fuel from being sucked through the Main (taller) Petcock to the Reserve (shorter) Petcock. What this does is gives you access to that last litre of fuel, but (and here’s the magic of this little invention) also warns you that you only have a few more kilometres of riding left and therefore need to find a fuelling point sooner than later. Yes, the reason for the petrol tap is as straight forward as that! It’s a simple invention which has been created to warn you of your imminent shortage of fuel within the next few minutes. There’s no baffling technicalities about putting your petrol tap onto reserve, besides the plain obvious ... find a petrol station, and fast. No damage will come to your engine when putting your bike on reserve. The only foreseen problems you may face are getting dirty fuel clogging your Reserve Petcock, and possibly even running into your carb, and heaven forbid, your engine. Saying that, my Main Petcock is currently clogged, hence I’m riding on Reserve at the moment without any hassles. This is how I came to find out about this little truth, and I hope that this article has helped reveal the hidden truth to many of you.